Maintaining a strong, healthy smile is a lifelong commitment that lasts. At First Line Dental, we help our patients prevent common dental problems and help smiles shine for years to come. 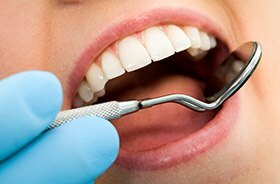 That’s why our team offers comprehensive dental exams, thorough cleanings, and a full range of dental services that are specifically focused on helping teeth and gums thrive. Keep reading below to learn more, or contact our Manchester, CT location today to schedule a first visit with Dr. Stanko. Why Choose First line dental for Preventive Dentistry? 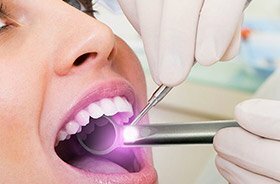 Even the most diligent brushers and flossers are strongly encouraged to visit a trusted dentist for checkups and cleanings at least twice a year. The truth is, damage and decay can develop in subtle ways that may not be noticed by untrained eyes. 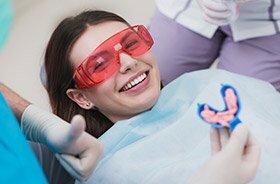 During these visits, our team will perform a comprehensive evaluation of the oral structures and also remove harmful bacterial buildup from the teeth and gums, leaving your smile feeling healthy and confident. When it comes to successfully treating oral cancers, early intervention is truly key. That’s why dedicated screenings are an important part of every regular checkup with Dr. Stanko. He will carefully review your lips, tongue, and oral tissue for suspicious symptoms that need further attention, including discolored patches of skin, strange lumps, and slow-healing sores. If needed, he will recommend a biopsy for a more concrete diagnosis. Chronic teeth grinding (also known as “bruxism”) is a very widespread habit that can negatively impact children and adults alike, especially those who experience a great deal of stress in their daily lives. Many patients aren’t even aware of the damage they’re causing because they only grind while asleep. Thankfully, a custom-made nightguard from our Manchester practice can work wonders when it comes to keeping teeth well-protected. This sturdy appliance will establish a barrier between the rows of teeth and prevent harmful contact, which means you can start feeling better each morning. While routine fluoride treatment is typically recommended to children, many adults can also benefit from this treatment. This process only takes a few minutes of your time and can be performed during six-month checkups and cleanings for optimal convenience. We also recommend using fluoridated toothpaste for an extra boost of enamel protection that can help reduce the risk of cavities. 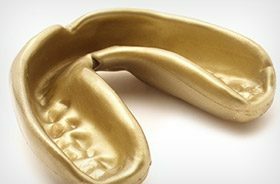 For athletic adults, it may be tempting to grab a standard mouthguard off the shelf at your local sports store – but you could be setting yourself up for distracting discomfort while out on the court or field. At First Line Dental, we can create a custom oral appliance that’s perfectly suited to you, providing optimal stability. 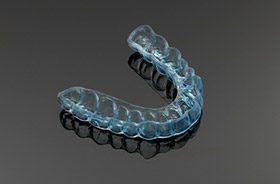 Better yet, these mouthguards are flexible enough to allow for clear speech and unencumbered breathing.